Sixty five percent of virtual work teams report that they have never had a team building session. Yet research shows that the virtual teams who have participated in team building exercises scored significantly higher in leadership, decision making and team performance. It’s time to take the next important step in creating virtual teams that work and join the Virtual Team Quest. Virtual Team Quest blends content and action – all designed specifically to ignite virtual team collaboration and virtual team communication – the two main drivers in virtual teams that work. Quixote Consulting’s virtual team activities enhance interpersonal trust. And our virtual team games lay the groundwork for effective virtual teaming. Virtual Team Quest team building activities simulate a day in the life of a virtual team. From conference call meetings to e-mail agendas, virtual work teams must work together, though physically apart, to reach the goals. However, effective virtual team collaboration and communication isn’t enough. The research plainly shows that virtual teams that work know each other well and like each other. Our activities and virtual team building icebreakers are designed for virtual team members to get to know each other, find out interesting things about each other. They provide a safe and fun framework to explore cultural differences (the leading cause of virtual team miscommunication). Virtual work team members leave the Virtual Team Quest training session with a positive experience that fuels collaboration and communication. And they get the tools to keep virtual team collaboration and communication strong – creating virtual teams that work, and keep on working. Please let us know which setting you are planning for your virtual team building and training session and we will make activity and content recommendations that best fit your unique situation. Each person gets images that are part of a larger sequence. Even though members are in different parts of the world, the group must decipher the sequence without any person seeing anyone else’s images while the clock ticks! Will the group see the big picture in time or will they get bogged down in details…or worse yet, fail to notice a crucial part of the image in time? This complex verbal communication skill builder has a powerful “a-ha” factor that makes the grand unveiling online unforgettable! Find out the human side of other virtual team members in this completely virtual team building icebreaker activity. Interview each other and gather interesting facts about team members’ home towns, cultures, countries, likes, dislikes and more. Virtual work teams share this wealth of knowledge with everyone on the team to forge connections that build trust and fuel virtual team collaboration. 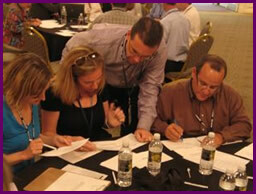 This experiential program is designed to help teams focus on the power of sharing best practices. Good virtual teams do well – great virtual teams share, communicate innovations and important information to make everyone on their virtual team work beyond expectations. The Power of Best Practices is ideal for teams that are cross functional, in remote locations in matrix organizations, or for any group looking to increase their capacity to proactively share information. This virtual team building activity actually mixes two powerful experiential activities designed to ignite the energy around best practice sharing with professional facilitation tools geared towards helping virtual teams communicate and begin exchanging information. Innovation rules as you utilize all the materials you can access to design and build the world’s most exciting roller coaster. This interactive business simulation encourages participants to work together within their small teams, as well as within the larger ‘theme park.’ Each small design team of 5 to 10 people works in their ‘theme park’ which are located in remote areas in the same building and then bring their sections together for the finale. Help Charlie build a Bridge Over Chocolate Waters for Wonka Inc. Enter a world of pure imagination as you design and build one-half of a scrumdiddlyumptious bridge that will transport the latest Wonka candy sensation from the factory to the waiting children. Like the Trans-Continental Railroad, your creation must link up exactly with your partner team – without either party ever seeing the other half of the bridge until the grand unveiling! This interactive business simulation encourages participants to work together within their small teams, as well as within the larger "company." Each small team or "department" of 5 to 10 people works in a separate area from the other teams. The "departments" must use limited supplies (PVC, balloons, bamboo stakes, rubber bands, etc.) to construct a device that will transport a maximum number of marbles safely. The clincher is that each team's section of the pipeline must interface with those before and after it, without anyone seeing the other sections until the grand finale. Catapult your team to success with this design and build program in which participants have to design and build a full functional catapult and test and compete for challenges of distance and accuracy. Partner teams build separate sections of the catapult in remote locations, communicate virtually with each other and then come together to see who can create the most effective and efficient Catapult. The objective is for the team to contain a “toxic spill” by transporting it into a safe container using the given tools. The task is challenging. The rules, even more so. The participants find that only through effective planning, sharing of ideas and resources and physical collaboration can this project be accomplished in the time limit given. This exercise splits the group into two subgroups. The larger one is called Site, which is analogous to the factory or lab. The smaller subgroup is called Central, which usually signifies management. The two are in separate locations. All the information is given to the Central group. All the materials (but none of the information) go to the Site group. Central has to convey to Site what has to be done, what the rules are, then figure out how to get them to do the job without ever physically visiting Site. Central is responsible for getting the job done, but they can only do it by effectively influencing/managing/leading the Site group. Marketing has just determined that a great opportunity exists for development of a new product. Together with R&D, the group is rushing to develop a prototype of the product to demonstrate to the Customer. The Marketing Team has the responsibility for understanding and conveying the product specifications to the R&D Team, and for demonstrating the product prototype to the Customer at the presentation. Here is what you know about the Customer’s problem and the specifications given to you. There is a Traffic Jam. The traffic jam involves six cars on a one-lane road. Three cars are backed up in a line going one way; the other three are going the other. All are facing the middle of the road. There is space for only seven cars on the road, and initially, the empty space is in the middle, between the sets of cars going in opposite directions. Can you solve the traffic jam as a virtual team in time before time runs out? 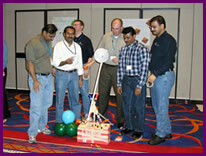 Many other Quixote activities can also be customized as virtual team building activities. Ask us about details. The challenges of virtual teaming are explored and a trained facilitator guides the team in coming up with a list of actions that will help their virtual team be more effective. Virtual Teambuilding sessions vary in length from one hour to half-day events and can be customized for your needs. Multiple rooms and access to cell phones and email.